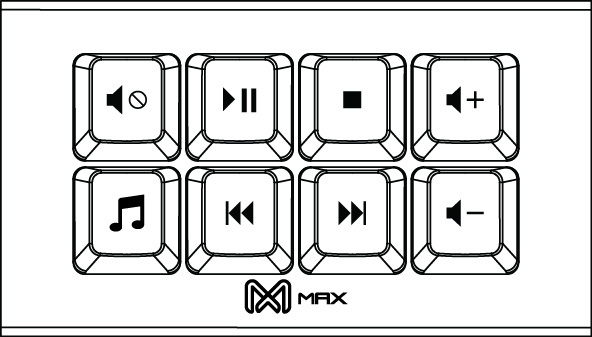 MAX Falcon-8 programmable mini 8-key keyboard/keypad/Macropad. Each key allows you to reprogram and use it as a media pad, OSU! rhythm game keyboard or even dedicated shortcut keys. With our simple and easy programming app, you can now create your own macros / media keys and combination keys without any coding experience!
. Windows 7, Windows 8, Windows 10. Great keyboard, no issues. Fun to assemble. Quality of a hardware part is very good. But software part is not so good. Firstly, the configuration application is for windows only( and look like it's written in VB )) ). Secondly, you can not setup keyboard to sent keys like F13-F24 and so on. But there is a trick. The firmware in fact can send any key code, but you have to patch the firmware manually. Overall, i like this keyboard. One of the best products I have purchased, For Gaming where multiple key press is needed to perform a single function, this little item is perfect. quality of all the components is outstanding and very easy to program. Work Great when I am doing digital painting with this, the 8 keys does provide a better workflow for my work. The only slight bummer is that I did wish the software could assign multiple key combination to one button instead of single key, because I am 2 buttons short on my workflow which would have been perfect. Overall still a great product! Edit: New V2 firmware and programming app now allow you to assign your own key combinations and macros. Perfect! Falcon-8 (DIY) unit has been discontinued and replaced by new and improved Falcon-8 RGB (DIY).